Spoke to spoke communication has always been super easy in ASA Site to Site VPNs. As long as your CRYPTO ACL has the remote subnets in it, and NO-NAT Statements are there everything pretty much works. The other day I had an issue getting it to work. After some research I was still struggling. All of my remote sites were in my Crypto ACL, my VPN was up and working to the hub, and any subnet behind the hub would work, but access to other IPSEC tunnels connected behind were not working. See rough sketch of the network below. I checked Nat statements, looked great, but my traffic was not flowing. I decided to debug via ASDM this is the error I received. Routing failed to locate next hop for ICMP then my outside (Louisville), and inside (Italy) address. Routing failed to locate next hop for TCP then my outside (Louisville), and inside (Italy) address. Routing failed to locate next hop for UDP then my outside (Louisville), and inside (Italy) address. Well, 192.168.17.0/24 does not live inside my firewall – it should be connected to the outside (US-Signal) VIA the VPN. Boom, that’s when it clicked. My nat statement is wrong, well not wrong, just missing. Since these connections are connecting to my outside network, and then going to my outside network – I need to create the nat statement with the source interface and destination interface being US-Signal. A few things to note about the below statement – I put it at the top of my manual nat entries, and notice the interface – both are US-Signal my outside interface. As soon as I added this statement everything worked great. All of my spoke to spoke communication flowed through the hub perfectly. The Fortianalyzer is a great product. It can give very deep analysis of exactly what is going through the network and allow you to create/schedule reports to show this data. You also have very quick detailed monitoring at hand with the Fortiview. By default the Fortigates connect to the FAZ via SSL, all logs are encrypted. Recently, and I am not sure what the issue is, I have been having issues with certain FGTs connecting to the FAZ via SSL (I think its a cert issue..but still checking). So, we have a different option, to use IPSEC to create a tunnel and allow everything to be encrypted that way. This works great. 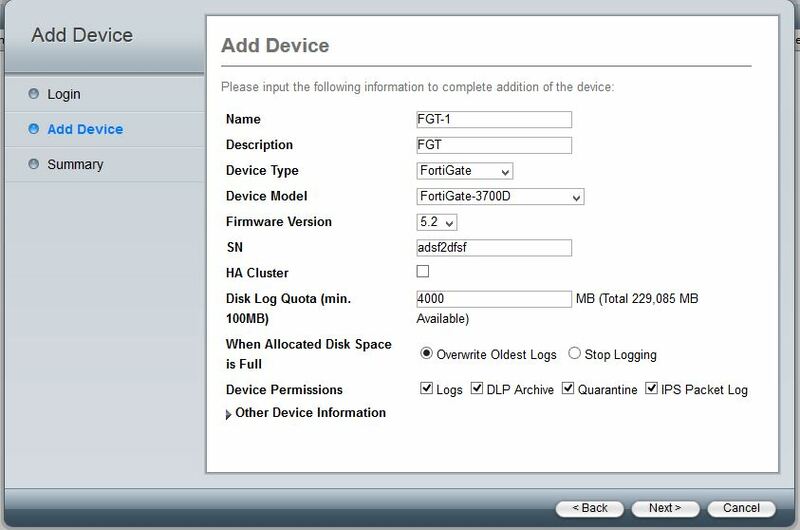 FAZ: add the device manually in the FAZ, enable “Security”, change the Local ID, Set the PSK. FGT: Go in through CLI, disable SSL encryption, enable IPSEC, set the PSK. So lets go to step one – adding the the device in the FAZ. Log into the device, and select whatever Adom you want to add the FGT into. Then select to add a device, once this pops up fill in the needed info, you will need an admin account. Select “Next” and fill in the needed info, you will need the S/N for this. Once that is added you will be able to edit the device. Right click on the device name and select Edit. From here you will need to enable IPSEC by checking “Secure Connection” and change the PSK. Notice Local ID this is what will identify the FGT. By default its the S/N but you can change it to anything. In this case I am using FGT1. Now you should see something like this, notice that “Secure connection” is red. Great, now its time for the device settings. I am going to do this through the CLI, its the only way to set the PSK as far as I know. The commands are listed below. One thing to note is that once you select “Encrypt” you disable SSL and enable IPSEC. Lets check on the FAZ, to make sure everything looks correct. Ok, this all looks great. That’s it, now we are using IPSEC to encrypt the logs. Its a good alternative to SSL if you find your self in the situation that the FGTs will not connect do to cert issues. There are multiple parts to the IPSEC SIte-to-Site VPN config. – Create Phase 1 (IKE) settings and apply it to the selected interface. – Create our transformation set (what encryption settings we will use for phase 2). – Create Phase 2 (ESP) settings otherwise known as a Crypto map. – Apply Crypto map settings specifying interface. – Create the tunnel object for peer. 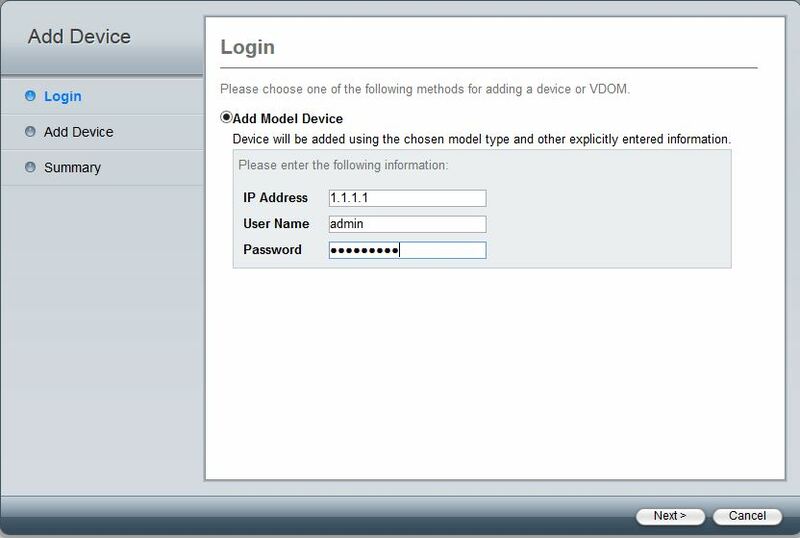 First create the objects representing what will be found on each side of the VPN. Now we need to make sure traffic is not being forwarded out of our WAN interface, and that the firewall knows to send it over the VPN. We do this with a “No-Nat” statement. This is different than what it once was in 8.2 and below. We will specify this with a different kind of nat statement. Now its time for the VPN settings! First lets create our IKE settings and enable it on the outside interface. Now lets create our Crypto map and put it all together. There are a few optional settings like the lifetime, by default its 28800. In this config I am just making it known that’s what its set on. Also you can set “reverse-route” which will add the route to the remote subnet into the routing table. This way you can push it out in a routing protocol. We will also need to apply the Crypto map to the interface. Our last step is to create the tunnel group with our Peer IP/DNS name and set the PSK.